Bon Jovi Livin on a Prayer Tribute Show is not currently scheduled to play in Branson. Join in the crowd and rock on with Livin' on a Prayer, a fantastic tribute to Bon Jovi, where you can enjoy fun rock music and skilled artists that will have you wanting more! 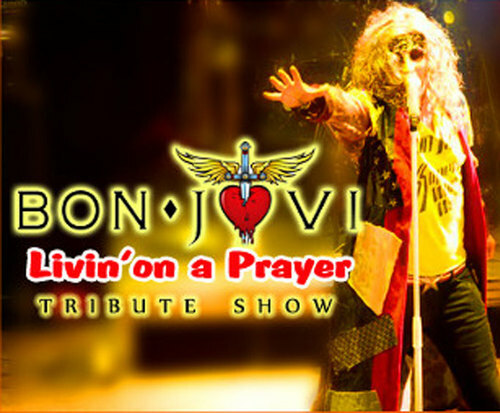 Livin' on a Prayer is a two-hour tribute show with some of Bon Jovi's popular hits, known for its “glam rock” style and fantastic guitar-work. With lofty vocals, sizzling guitar tricks, and the attire of glam rock, Branson's top Bon Jovi tribute band will show you the energetic dynamics of Bon Jovi for an experience you will not forget! Performing famous songs about “Runaway,” “You Give Love a Bad Name,” “It's My Life,” “Have a Nice Day,” “I'll Be There for You,” and the tribute's namesake “Livin' on a Prayer,” the tribute band will perform a family-friendly show that will have you convinced that they are the real band! Paying homage to one of music's most charismatic rock duos, Jon Bon Jovi and Richie Sambora, Livin' on a Prayer features some of the band's most memorable songs, including several number one hits. Formed in 1983, Bon Jovi has released 13 studio albums, two compilation albums, and two live albums, and due to their popularity in the 1980s and '90s, they have received many Grammy and American Music Association Awards. In 2009, Jon Bon Jovi and Richie Sambora were inducted into the Songwriters Hall of Fame, but in 2013, Sambora departed from the band. The current lineup consists of lead singer and namesake Jon Bon Jovi, pianist and keyboard player David Bryan, and drummer Tico Torres. The Billboard Music Awards called the group the "Top Touring Artist of 2014," and they are considered one of the world's best-selling bands of all time. Enjoy the big concert experience with this fantastic Bon Jovi Tribute Show without all the fuss – this amazing experience is available in the country setting of Branson, Missouri!